Explore our blender recipes for soups, smoothies, sauces and more and learn to make the most of this indispensable kitchen tool. 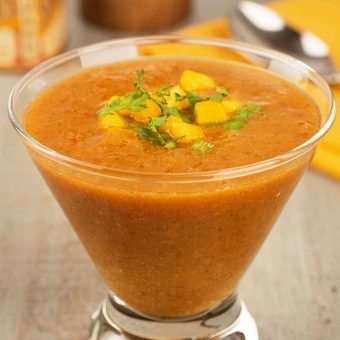 This sweet and savory variation on gazpacho soup uses mangoes, tomatoes, jalapeño, cilantro and lime juice to make a fresh-flavored summer starter. 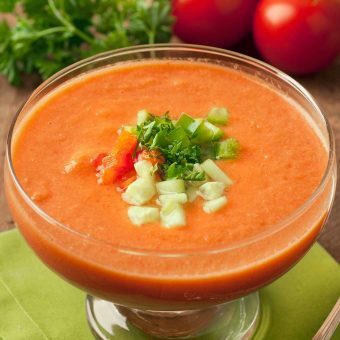 Our gazpacho soup recipe is a classic blend of fresh tomatoes, cucumber, red and green bell peppers and jalapeño, flavored with onion, garlic and sherry vinegar. 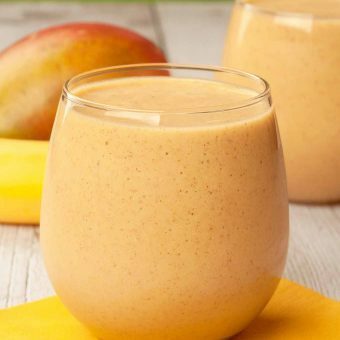 A creamy, nutritious breakfast smoothie made with cashew milk, pineapple juice, Greek yogurt, banana, mango, flax seeds, chia seeds and spices.